This is a review of Skinception Intensive Stretch Mark Therapy. This cream promises to restore elasticity to the skin, raise collagen production, smooth furrows, even the skin’s tone and fade discoloration. It promises to make stretch marks visibly fade within two months but results are declared as beginning within four weeks. Read more to learn about what ingredients make up this product and find out our opinion about it. Regestril is claimed to improve the depth of stretch marks as well as improving their color and width. Skin should be made thicker, smoother and healthier in appearance as well. Darutoside reduces the length of stretch marks, indentation and increases the smoothness on the surface. Pro-Sveltyl is a protein-repair enzyme that improves surface irregularities like acne scarring. It can reduce the visibility of stretch marks while also tightening and hydrating skin. Pro-Coll-One+ makes skin smoother. You should use enough cream to cover the affected area. The cream must be applied into your stretch mark and time allowed for it to be absorbed by the skin. Daily use is recommended for the best results. A jar of Intensive Stretch Mark Therapy lasts between 30 and 60 days depending on use. Skinception warn that everyone’s skin is different and so their products may cause a rash or a breakout. Customers with sensitive skin are advised to test a small area on the arm or jaw line before applying the product to the areas that need treating. They promise that it is safe for pregnant women to use but they suggest that you consult your physician if you are concerned. A single jar, which is a month’s supply, costs $69.95. However, it is better value to buy this product in bulk, as it will work out cheaper and includes free gifts. 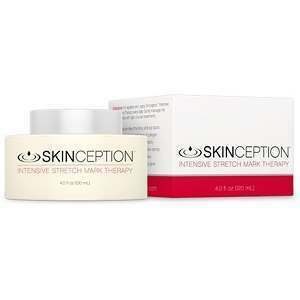 A three-month supply includes a free jar of another Skinception product called Kollagen Intensiv and costs $154.95. A six-month supply costs $289.95 and includes free shipping within the USA and a free jar of Kollagen Intensiv. A nine month package, which is a limited time offer, provides you with a 10th jar free as well as free USA shipping and a free jar of Kollagen Intensiv for $399.95, or $39.99 a month. Skinception have a 90-day guarantee that allows you to turn the product if you are dissatisfied with the results of using Intensive Stretch Mark Therapy. A consumer will receive a full refund excluding shipping and handling. This guarantee is extremely reasonable as it only imposes a time restriction and a generous one as well. There are no available customer reviews on Skinception’s website although the opinion of an M.D and cosmetic surgeon is offered as well as a number of clinical studies to highlight the effectiveness of the product. This product comes with a fair guarantee, which leaves ample time for the customer to try Intensive Stretch Mark Therapy for two months to see if it works as it’s supposed to and still give them time to return it if necessary. It is possible for someone to develop a rash or breakout after using this product but the manufacturer have admitted to this possibility and suggested a course of action to ensure that this sort of reaction is minimised if you did happen to suffer it. It is unfortunate that the reviews by customers were not given, as it would have been easier to determine the effectiveness of the product and to see if the price would be worth it. The cream is quite expensive and if it turned out to be ineffective at dealing with stretch marks then it would turn out to be a very expensive skin cream indeed, even if free gifts are offered for larger orders. This product may well meet your needs but you would have to try it yourself to find out for sure. David Carney	reviewed Skinception Intensive Stretch Mark Therapy	on June 29th	 and gave it a rating of 4.